Yú dúàilián zhī chū yūní érbùrǎn,zhuóqīng lián érbùyāo,zhōng tōng wài zhí,bù màn bù zhī,xiāng yuǎn yì qīng,tíng tíng jìng zhí,kě yuǎnguān ér bùkě xiè wán yān. There is a variety of lovely flowers in the world.Tao Yuanming in Jin Dynasty only loved chrysanthemums。From the Tang Dynasty, people are very fond of peony. But I do love lotus. In respect that It is not contaminated even growing in the muddy pond, and does not seem seductive even being washing off in clear water for years .Its middle is empty, while the external is straight without any vines or side branches. The farther, themore clearer aroma. Standing upright in the water, dignified and clean. It canbe only appreciated distantly but not touched blasphemously. I believe that the chrysanthemum is a hermit in flowers while the peony is a rich and the lotus is undoubtedly a man of honor.We seldom find someone loves chrysanthemum like Tao,However, people like me who show the enthusiasm in the lotus are nearly nowhere to find. Then who likes peony? Almost everybody! (1)The Character “水陆”means water or on the land. (2)“草木”means natural plants and flowers. (3)The character”蕃”means so many,(4)”淤泥”means mud. (5)The character”濯”（zhuó）means wash off,(6)”清涟”（lián）means clear water. (7)The charact” 鲜”（xiǎn)means seldom,”闻”means heard of. Tao Yuanming is a very famous idyllist in Jin Dynasty,his most famous poet is On Driking Wine. 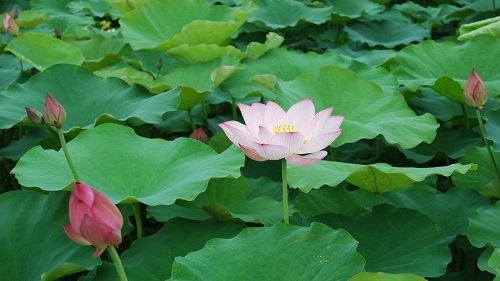 The author of the poem very loved lotus.The most famous sentences on the poet is “出淤泥而不染，濯清涟而不妖，中通外直，不蔓不枝，香远益清，亭亭净植，可远观而不可亵玩焉” is still polular in China till now.